Traditions — Red Barn Children's Center Inc. Traditions play an important role at our school and many have been in place since the early years of the school's existence. Alumni parents often recall these activities which lets us know the impact of these traditions. Some of the these experiences are listed below. 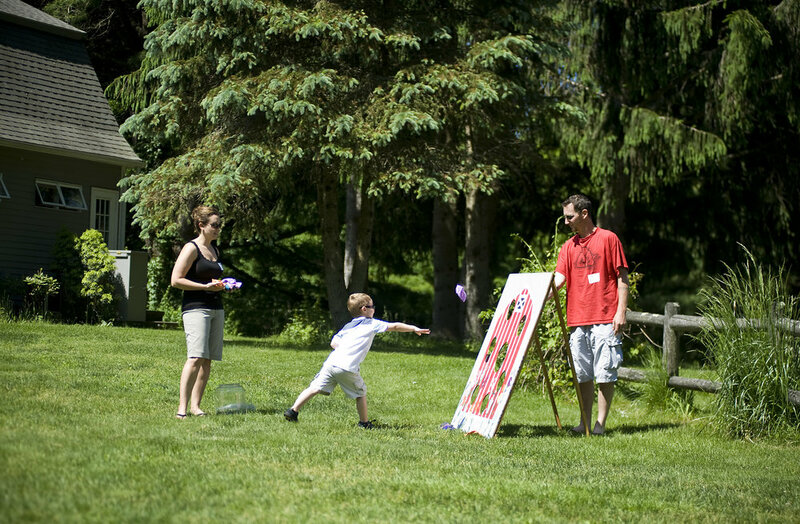 Family day is a long standing tradition occurring during the final weeks in May. Enrolled children, friends and family come together for an afternoon of games, food, and community. The children sing, play yard games and everybody enjoys the various potluck spread. We even have llamas and chickens join the fun! Families take this opportunity to watch their children "show off" their school and to get to know other families. This event shows our appreciation for allowing us to be a part of the children's lives. In 2015 we planted a white spruce evergreen to mark the transition from the Stuhlman's ownership of Red Barn to the Guelke's ownership. The children create bird and squirrel feeders, Cheerio garland and other treats for the woodland creatures. These items are carefully placed on the tree by the children and winter songs are sung. This is a fun way to celebrate both the children's hard work and our appreciation of the animals who make Red Barn their home. Just before the Thanksgiving we hold the Fruit Feast. Each child is asked to bring in a piece of fruit to be shared. With help from their teachers, the children peel, cut and prepare their fruits in school. The Gray Barn opens their doors to the Little Barn children to share in the feast and fun! Fruit is shared and Thanksgiving songs are sung. The Fruit Feast is celebrated over the course of the week so all children can attend. Throughout the school year we have several traditions which the children take an active role in. Pumpkin muffins in October, Cranberry relish in November, along with gingerbread people in December, all create fun memories. Gingerbread people making is an especially fun time as children cut out and decorate their own gingerbread person. All are shocked when its found out that all of the gingerbread people have run out of the oven! Luckily they leave a trail of flour to followthat leads back to their classroom. This story may sound familiar if you've ever read Jan Brett's Gingerbread Baby. In addition to the child created food items we host a bread exchange in January that serves to highlight our children's different backgrounds. Parents either buy or make a special bread that is brought in for the children to share. We get a chance to learn about what makes the bread special and celebrate that bread is a part of all cultures.